What does the exposure of the leaked Falciani list mean to the common person? Probably nothing much to the major victims of foisted poverty. As for the disciples of Ali Baba, perhaps a little regret for not being more careful, but certainly not shame because they’re insolent. 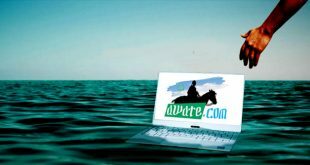 Beginning in 2006, the world lived the Wiki-leaks drama directed by Julian Assange. In 2013, that was followed by its replay in episodes directed by Edward Snowden. Now it’s time for another show: The Falciani List! But what does the Falciani list mean to different people and entities? Evidently, for governments, the list mainly shouts out “tax evasion”; concern over funding terrorist activities may follow next in importance. For the skeptics, though, it is a confirmation that the world is dominated by a corrupt banking system operating on behalf of rotten governments, or the other way around. The Falciani list encourages skeptics to be more so. Most of the skeptics, perhaps all of them, are in “the bottom half of the global population [who] own less than 1% of total wealth” of the world. And the defenders of the unjust financial system of the world are the rich who own “87% of the world’s wealth.” Naturally, there are apologists who think they can elevate themselves to the top 1% by sucking up to the rotten class–just like the zealots who think they can grow wings by parroting scripture. In the case of the apologists, the scripture is authored by Milton Friedman. In October of last year, Credit Suisse issued its “Global Wealth Report 2014” in which it calculated the world wealth to be $263 trillion. As usual, it didn’t bother to report on every country separately, but by regions. It reported for Africa as a continent. According to the report, in 2014, the total wealth of Africa was $2,831 Billion–compared to India’s $3,604 billion and Latin America’s $9,113 billion. Comparing it against North America’s $91,240 billion, and Europe’s $85,200 billion is even more depressing for Africans, to say the least. An African adult’s wealth is $5,080, compared to an Indian’s $4,645, a Latin American’s $22,997, a North American’s $340,340, and a European’s $145,977. While 0.7% of the world population owns 44.0% of world wealth, 69.8% owns only 2.9% of that wealth–to the audacious, the rich deserve to be that rich because they worked for it, they created credit, in paper, thus they can buy the reader and his neighbors up to twenty countries in any directions of the four winds. That is doubtful if even Milton Friedman himself would be able to defend morally and convincingly, let alone his disciples! Looking at the HSBC figures from an African perspective, it’s discouraging: the looting that started centuries ago with colonialism has not stopped; what appeared in the Falciani list is just a drop in a large bucket. African resources were always being looted, and continue to be. The downtrodden of the world know that the banking system stinks. The helpless poor block their nose to avoid the foul smell as they collect leftover that securely keeps them in perpetual poverty. It’s painful to be overwhelmed by the robbing banks and their thieving clients who portray the banking system as a shining example of what capitalism is supposed to be. Yet, to the common people, the Falciani list is another confirmation of how unjust, immoral, unscrupulous, and cruel the banking system (and the world system) has become. Corrupt officials who loot their people are encouraged by immoral banks like HSBC who not only hide the thieves’ dirty money, but also coach them on how to steal, and facilitate for them means to funnel the looted money. 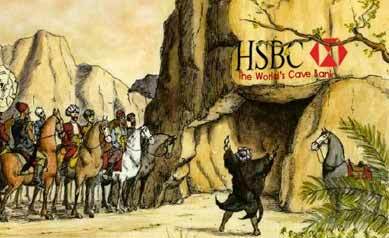 It’s the modern day Ali Baba’s Cave, only with a bigger gang than Ali Baba’s forty thieves. The USA convicted Tesler, but certainly not for being part in corrupting Nigerians, or for looting Nigerian money, but for funneling the bribes from the USA. If the international banking system which is in Western countries, didn’t facilitate the crimes of such crooks, the situation of African victims would have been slightly better. After all, it is the Western banking system that is enabling the victimizers of Africans. The West is interested in investigating the looters for tax evasion, not for robbing their poor countries–who cares as long as they pay taxes! And then they wonder why the world hates them! Herve Falciani copied the data in Geneva, a year before he appeared in Lebanon in 2008 where, according to some reports, and accusations by HSBC, he went to try to sell the data. He didn’t. After a few years of drama, the French got a hold of the data containing a list of more than 120 thousand names of HSBC customers with account details. The list is now known as the Falciani list. Though the French government didn’t publicize the Falciani list, according to reporters quoting Falciani, apparently the French used the list in their own arm twisting exercises, such as what they did to George Papandreou, the Greek prime minister who was reportedly pressured by the French president Nicolas Sarkozy “to enforce the austerity policies in Greece,” in a bailout overseen by the Troika of the European Commission, the European Central Bank and the IMF. Papandreou yielded to the pressure because of the whisper that 500 million Euros was stashed by HSBC in an account under his mother’s name. Towards the end of last January, the left wing party SYRIZA took power in Greece and rejected the bailout agreement; it is renegotiating the EU bailout. Felciani is accused of many things, including creating a shady virtual company called Palorva, that he set up in Hong Kong to coach bankers, apparently, on how to lure wealthy people who hold suspect or illegal money for safekeeping and laundering. The Wall Street Journal reported Palrova’s website carried a motto: “Business is the art of extracting money from another man’s pocket without resorting to violence.” It is an old “wisdom” embraced by those who believe it is alright to swindle as long as you are not caught by the wrong people. At the same time, quoting Der Spiegel, the Irish Times has reported that, in 2013, Falciani stated, “Banks such as HSBC have created a system for making themselves rich at the expense of society, by assisting in tax evasion and money laundering.” If true, that suggests he is a genuine whistle-blower and it could absolve him. The French government handed the Falciani list to Le Monde, a renowned French newspaper. But Le Monde was overwhelmed by the sheer size of the data and handed it to the International Consortium of Investigative Journalists (ICIJ). The contrast between the USA, at the top, and Eritrea, an African country, at the bottom is dramatic enough. 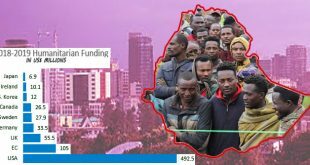 But first, let’s see what the actual data says–and we will put it alongside Ethiopia’s figures because the Eritrean regime and its supporters do not understand anything unless it is compared and contrasted with Ethiopia. There is a never-ending rivalry that crosses the boundaries of PFDJ’s Absurdstan. The moment the Falciani list became public, Eritreans were quick to speculate, they went as far as whimsically associating names to the accounts. In 1981, Hassan Abdalla Bashir, then aged 24, opened an account with HSBC in Geneva as a “banker” when Eritrea was at war. Six years later , it’s a Ghebreselassi Kidane Habte, 37, [presented to HSBC as a driver] residing in Asmara in 2007 has more than $ 106 million, while Hassan Abdalla Bashir, the “banker”, has more than $209 million. No information is available about these two characters in a country Amnesty International calls a “huge detention center, where prisoners, citizens in their own country, are regularly rounded up by the army, forced to work for a phagocyte party state. Apart from the above, not all the details of the accounts have been disclosed so far though they will certainly be. However, it’s understandable why Eritreans would reach to conclusions, particularly regarding the one account (the most significant) that holds $695.2 million–though today’s Le Monde brief information will send many in a tangent. 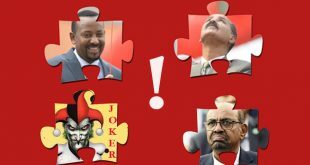 It’s already clear that half the amount identified as Eritrean seems to belong to two people though speculators insist the money belongs to the ruling party (PFDJ) or its boss. It seems remote speculation, but surprises are welcome. The PFDJ is simply a monopoly controlling all aspects of the Eritrean economy, and life. Land within the Eritrean territory, and natural resources below and above the surface, is all owned by the PFDJ government which is notoriously greedy. In a 1993 public meeting, asked about suspected mismanagement of the party finances, Isaias Afwerki, made fun and half smiled at the public before responding with a sneer: just send us the money, we will take care of the rest! It’s worth remembering that the Eritrean government aggressively sold passports to foreigners, even to the likes of Al Shabab. Importantly, in the first few years of the last decade, a colonel from the Eritrean immigration office had set an office in the Eritrean embassy in Kuwait from where he sold large numbers of passports to the Bedoun, the stateless persons of Kuwait. Certainly, passport sales would not bring revenues in the hundreds of millions, but any foreigner (a government, a criminal outfit, pirates, political entities in the region, or filthy rich foreigners) could have used an Eritrean passport to open the account, or the funds could simply have been funneled through an Eritrean bank. The PFDJ would facilitate any transaction for a fee. There is also the possibility that revenues from mining and other resources could have been siphoned to an HSBC account by any party. However, it is also possible that we may discover the remaining money is owned by someone other than the ruling regime; individuals who enriched themselves somewhere else. At this moment, it’s all speculation. There is no concrete evidence to implicate the PFDJ, not yet. That is why it is prudent not to make statements without having enough proof less the credibility of the speculators is damaged. Record of Completion form to use ?